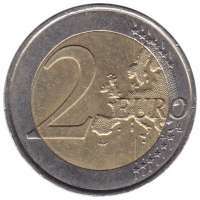 €2 commemorative coins are special euro coins minted and issued by member states of the eurozone since 2004 as legal tender in all eurozone member states. Only the national obverse sides of the coins differ; the common reverse sides do not. The coins typicallycommemorate the anniversaries of historical events or draw attention to current events of special importance. The number of commemorative coins is limited to two (before 2012 to one) per country per year and to 5 percent of the total mintage output. 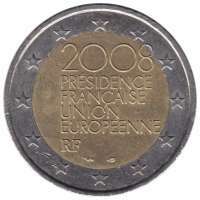 The inner part of the coin shows the inscription 2008 PRÉSIDENCE FRANÇAISE UNION EUROPÉENNE RF; the mint mark and the mintmaster's mark are located below, to the left and the right respectively. 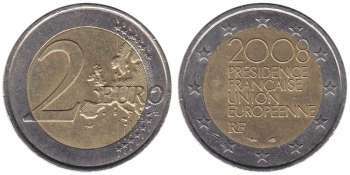 The twelve stars of the European Union surround the design on the outer ring of the coin.